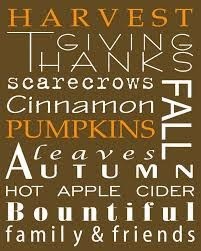 We are about to enter my favorite season of the year. FALL. Really, I love all the seasons. I love the change, the newness, the hope that is easier to feel, the weather, etc. You could say I am adaptable, and I am, but there is a predictability to the change because I expect it and want it. I think I just need change sometimes. It gets me out of a rut and moves me into the more that I desire. But there is something about fall. The crisp mornings and warm afternoons. The bright blue sky. The crunch of leaves under my feet. Apples. Pumpkins. Mums, oh how I love mums. Decorating for the season. Baking lovely smelling loaves and muffins that fill me with joy. It is a generous season, one that people are thinking about others a little more. Or at least that is the way I want to live in this season. But, this time last year was one of the hardest seasons. You can read about it here. It was hard. And a year later, it is hard to avoid the thoughts of “what could have been”. It was a hard Fall season. But there were good things in it, too. My sweet class of 16 four year olds that greeted me every day made it a lot easier. Our church family, boy do I love them, and they have loved us fiercely through it all. And now, this fall season does not seem any easier than last fall. Actually, it is hard to see the hope some days. And not just with infertility, though that is always there, every day. My health has been something of concern this summer. What I thought was just a pinched nerve or inflamed muscles in my back that was causing my hands and arms to be numb…well, that has turned out to look more like MS (Multiple Sclerosis). My doctor has not diagnosed me yet, but he is testing for it in every way possible. I feel like a lab rat most days. I have 3 more weeks of testing and labs before the final diagnosis will take place. And y’all, the waiting is so hard. The unknown is terrible. And reading about it on the internet….well, you can just forget feeling normal after all of that mess! I feel ok most days, I feel like I can do this and can live a somewhat normal life through this. Right now the only symptom I have is numbness in my hands, which is not debilitating right now and I can do just about everything I could do before July (when the symptoms started). Some days are harder than others. Some days I am really tired. I am longing for some good news, y’all. Something that will make this season a little lighter, a little less hard, a little more joyful. A kairos is a moment in time appointed by God. A moment where you know God is speaking and moving us to action. 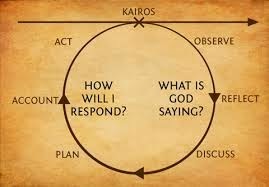 So, the learning circle is a way to process a kairos moment. We have been asked to process something in our life through the learning circle. So, my kairos moment is deciphering what God is saying through all of this. But also knowing I have to TALK to people about it. I have to share what is going on in my life. I cannot just act like everything is ok, but I have to share how I am really doing. Observe: What is happening? How am I responding? What am I feeling? I am being tested for MS. This is hard. I don’t know what to think or feel some days. I feel like running away from my life sometimes…but that seems too dramatic. I am responding by going through the motions, by doing what I am supposed to do. I am listening to the doctors, to people who have been through the same testing process, to people who have MS. I am waiting. I am feeling scared. I have some hope in there, too, though. My sweet husband is holding out on hope, and that makes me hope a little more. He prayed the other night about God being able to stop all of this with just ONE word. God is that powerful. He spoke the world into being. He made Adam from dust. He can make all of this go away. I am holding on to this truth right now. And that feels a little lighter than holding onto this disease-burden. I also know that by sharing this news with others, I am not carrying the burden on my own. I am allowing others to carry it with me. And that helps a lot. Reflect: What is God saying to me about this? What has Jesus done about this? Who am I in light of what God has done, and in light of what God says? 1. Psalm 68:19 Praise be to the Lord, to God our Savior, who daily bears our burdens. 2. Galatians 6:2 Carry each other’s burdens, and in this way you will fulfill the law of Christ. Discuss: How does God bring a new perspective? What is God calling me to respond to Him? I think the new perspective has come by sharing the things in my mind out loud–they become more real, but a little less scary. Saying I may have MS has a weight to it, but somehow when the words are out of my head and out of my mouth, there is a weight that is lifted off me. In sharing about it, I am less alone. I am more in communion with others. I am where I am supposed to be. I am NOT alone. He is calling me to draw close to Him, share my life with others, be vulnerable and real. And it all goes back to being INTENTIONAL. Funny how things circle back around. Plan: How will I respond? I have been called to share my life with others. Through discipleship, through relationships. I do not have to be afraid of sharing my weaknesses. When I am weak, He makes me strong. I will share with people (even people here on my blog), because sharing life is important. It is what makes us real, human, accountable. I need other people, too. I really need people to surround me, give me encouragement, and listen to me. I can receive from others. I will receive from others. So, this week, if my Bible study girls have not already read this and know, I will share with them. I will let them know what the past few months have been like. I knew I was supposed to say something last week and I chickened out. I don’t even know why. When people ask, I am going to tell them how I really feel. I will not dance around it. I will share. I will be open. I will be vulnerable. I am not alone in this. Accountability: Who is going to ask me if I follow through with my plan? I know the Engineer will ask me. And I know my huddle folks will ask me next week. It takes courage for me to share these things. It takes courage to be vulnerable. I can sometimes do it behind a screen a lot easier than in front of people. I will do the things God has called me to do. And I know He will deepen relationships, establish new friendships and make a way for me. This is more than healing for my body, it is a healing for my heart, too. I will share my progress on the blog more often. I will let people know how I am really feeling. So, there it is. How I am really dealing. I don’t want to be dealing with this, but it is part of life right now. I am so thankful for the family and friends how have supported me in this season. The cards in the mail and the sweet text messages brighten my day. I know the more I share, the more healing will happen. Healing for my heart and prayerfully for my body, as well. I am praying for restored hope in this season. I'm April, wife to an incredible man, I call The Engineer and mama to 2 sweet little boys. I love Jesus, creating a non-toxic home environment for my family, cooking for the people I love, and reading new books. Hi! I just wanted to let you know I use some affiliate links in my blog posts and pages. An affiliate link gives me a little bit of change if you happen to click on the link and buy something. It does not cost you anything extra. I promise to never put a link up just to get money. I have actually used these products. All opinions about products, books, websites, etc. are my own and are completely honest. If you have any questions about this policy, please feel free to contact me!